We partnered with a food truck event and held test drives, an EV car show, and several signs and booths inside the food truck event itself. We had Ford, Tesla, BMW, Chevy, and a used EV car dealer providing test drives of different models, and about 25 EV owners displaying their cars. We plan to partner with Civic Center Eats (food truck market) where two thousand people eat lunch during the week. We will close Bannock street in front of the City and County building and host test drives with multiple EV models and e-bikes. The first 100 people to test drive will receive a free lunch at the food trucks. 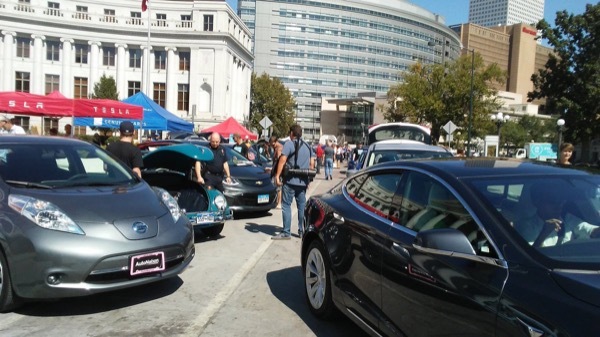 Also along Bannock will be an EV carshow where EV owners, City fleet vehicles, and electric business fleets will showcase different models and interact with the public. IMPORTANT: We are no longer accepting EVs for the EV Carshow - it is full :). Vehicles will also be staged at various points throughout the food truck area to interact with attendees and point them to the test drive and EV carshow. Registered attendees report 519,884 electric miles driven.